Someone told me that grief requires being able to feel more than one thing at a time. I thought about that a lot hearing Ixchel’s striking story. 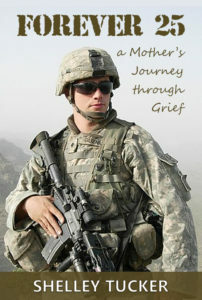 Her son died in a war she didn’t believe in. She got the news while attending the birth of her grandchild. Talk about the cycles of life! An eloquent writer and a warrior herself, she doesn’t let fear keep her from navigating the deep, universal realms of grief. 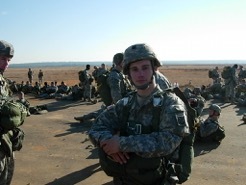 Gabe was in the army. 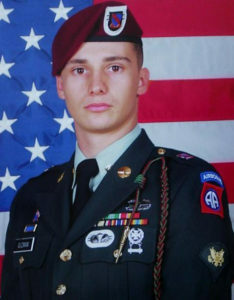 He was killed by a roadside bomb in Afghanistan. He was 25 years old. It was so hard to call the family and tell everyone else. There is no easy or good way to share the news. I found it especially hard to tell my ex-husband, his father, even though we hadn’t spoken in years. I don’t think anything can prepare a person for this kind of experience. So, no, not really. Even though Gabe was in the Army and I always knew he could be killed, I never really thought it would happen to him. I don’t think he did, either. He had done nothing to prepare and it was really hard for the family in distributing his belongings. What if anything might have helped prepare you better? I’ve read that the happiest people on Earth are the Bhutan people in the Himalayas and the surprising reason for their happiness is that they contemplate death for 5 minutes every day. Reading that, I think that if our culture accepted death and the grieving process better, it would help us all. In many cultures there are grieving rituals. Others have rituals to honor their dead each year, such as the Day of The Dead in Latin America. I think if I’d grown up in this type of culture, or adopted these philosophies, that would have helped me more on a personal level. It would also help on a societal level to have others share this same acceptance of death. We just don’t have that here in the US. We are taught not to accept death and we push it away and we don’t know how to talk about it. What really matters is the connection to the people in my life, to my family and friends and those I love. My connection to my son is real. It continues, even though he is gone. For me, grieving has been allowing my feelings to come up and to feel them when they do. I haven’t put any expectations on how I should feel or when to feel. I know in my heart that the feelings I have for my son are a reflection of the love I have for him. It is one and the same. Sometimes I love watching a movie of loss or the war, as it stimulates my feelings and I will cry and release a lot of pent up emotion. Other times I can’t watch anything that reminds me of the war. The most important thing is to be present to my own feelings and let them flow. I experienced deep growth and awareness through the process. The year Gabe died was one of the worst years in my life. It was a year filled with tragedy. I was living in Mexico at the time and after the funeral I returned to Mexico with a folded up flag, alone with my sorrow. I was lost in my pain. It was good that I had work to do. It helped to keep busy. I was an assistant at a retreat center and we had people coming that needed to be taken care of. In my off time I would lay in bed and listen to a song Gabe liked, one we played at the funeral, called “My Angel Gabriel.” I’d listen to it over and over again. As I contemplated how so many bad things could be happening to me in one year, and why, I tried to see what I could learn from it all. I realized that in stripping away my illusion, I could look more deeply into my heart. It taught me that the material things, even as a source to my work or freedom, were all just things. They could be replaced. The source of my existence was within me, and in my connection to God/Spirit. What really matters is the connection to the people in my life, to my family and friends and those I love. My connection to my son is real. It continues, even though he is gone. My love for him will always be with me. It taught me how to let go, not of love but of illusion and ‘stuff.’ By the time my car was wrecked I let go of it easily, happy that my friend had survived. So through the tragedy, I’ve learned how to better live. I am happy for that. For some reason, the words “I’m sorry for your loss” really bothered me to hear. They felt so insincere. Gabe dying isn’t just something that was lost. People who tell me I shouldn’t be sad, saying something like “he’s in heaven so you shouldn’t be sad for him.” Some of my “spiritual” friends are the worst. They feel they need to point out that death is just a transition and act like there should be no feelings or grieving around it. I know this is more a reflection of their discomfort with death than it is my reality, but it also makes it hard to share my experience with anyone. It has taken me eight years to finally start writing and sharing more about it. I would like people to be more understanding and accepting and less judgmental. For some reason, the words “I’m sorry for your loss” really bothered me to hear. They felt so insincere. Gabe dying isn’t just something that was lost. It would have been much more helpful and comforting if people would just listen and hear what I have to say, or to simply hold me and be present to my feelings. The biggest surprise was that I just didn’t feel it was real. 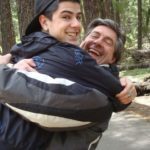 I know it’s normal for us to go through denial, but I am fairly intuitive and I thought that if anything bad ever happened to one of my kids that I would intuitively know. I thought maybe I’d get some sense of it or premonition. But I didn’t feel any of that, I just felt like they’d made a mistake, and I had to see his body before I could convince myself that it wasn’t just an awful joke or mistake. What would you say to someone facing the death of a child? I would like them to know that they aren’t alone (even though I’ve gone through much of this process alone). And that it’s okay to grieve and feel what you feel. When I hear of someone losing a child, or anyone close to them, I respond with empathy and compassion. All we can do is hold space for another through their own process, but it can mean so much to have people that are there for us to do that. I’d say talk about your child. Remember him/her. Remember your love, the joy, the grief, the laughter and the times you cried. Let yourself feel however you feel. Grief has no pattern or plan in how it shows up for you. Let yourself feel it all. Have a ceremony, if it calls to you. Honor the life and the death of your child. I’m working with a friend to plan a special kind of grieving ceremony, in the ways that indigenous tribes used to do. I want to be heard. I want to be supported and support others. I want to bring these ways back that help us transmute the most difficult experiences of our lives, that of losing our babies. I have grown through the experience. I live more in the moment, not wanting to put off anything that’s important to me. (I still strive to do this better.) I’ve learned to be less attached to things and more attached to the people in my life. I’ve realized that I am vulnerable and bad things can happen to me. Somehow that fragility makes me stronger, it helps me with the inner strength that Gabe taught others to find. In some ways that has given me depth, in the same way that walking on fire teaches us that we are capable of so much more than we ever thought. It has taught me more compassion for anyone who is going through a tough time, though I have less tolerance for people who complain about the mundane irritations of life when there are so many more important things to focus on. You never know when that last time will be. I tell my kids I love them every time I see them or talk to them. The intention of keeping our hearts connected helps make it so. Do you have other children and if so, has your parenting changed? Did you think about or go on to have other children after the death? I have two adult daughters. I also have eight grandchildren, including Gabe’s daughter, Angela (also an angel, like her dad). She was a lot of the reason Gabe joined the army, he wanted to support his daughter. He thought of her often, he kept a picture of her with him, sharing it with his friends. In many ways Gabe’s death has brought us closer together. My daughters and grandchildren are important to me. Gabe’s death was a loss for us all. 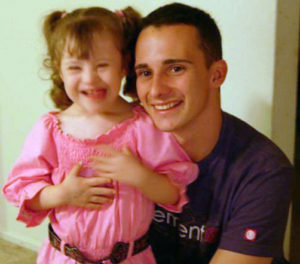 I try to spend time with Angela and try to help her know who her dad was, but she also has Down’s Syndrome and she will never know him and understand his death in the same way another person might. Also, because she lives with her mom, sometimes I just don’t get a chance to see her very often. There have been challenges for our family as well. What has changed is that I’m much more aware of my relationships with my children and grandchildren and I want to keep them as loving and harmonious as possible. I look back at Gabe’s last visit home. I was in Mexico and trying to decide if I should come to the US to see him. Sometimes on his visits he hadn’t found as much time to spend with me as I would have wanted and that hurt. So, I could have let that keep me from making the trip. I am so glad that I didn’t let it stop me! If I’d had to live with knowing I had passed that by it would have really been hard. I don’t want the minor upsets in our family to get blown out of proportion and keep us from our time together. You never know when that last time will be. I tell my kids I love them every time I see them or talk to them. The intention of keeping our hearts connected helps make it so. As far as going on to have more kids afterwards, I was in my late 40’s when Gabe died and I’d had my tubes tied years before. With my kids grown I hadn’t thought I’d ever want more kids. But I have to admit that when Gabe died there was a part of me that wanted to somehow replace him and have another son. I even entertained the thought of adopting an orphan, especially an orphan of war. 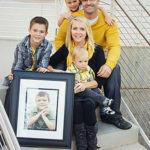 I felt an instinctual part of motherhood that needed to fill the gap he had left. I’ve channeled my love into the rest the family instead. I wish more people could have known him. I want people to remember the kind of person he was. He inspired and encouraged people to be the best they could be. There were so many people he knew, friends and family, who shared stories after he died of how he had inspired them that way. I never knew so many people knew him. He would also joke and laugh a lot. He wasn’t perfect. He was human. But he was a good man. People loved him. Mostly, I wish his daughter had known him and grown up with him in her life. There is nothing that can ever replace his presence for her. And, though she’s a happy child, with a good mom and a step-dad she loves, I know it will never be the same for her. I felt him strongly the first year after he died. I remember feeling him when I was at the hospital with my friend who had a broken arm from the potentially fatal car crash I mentioned above. 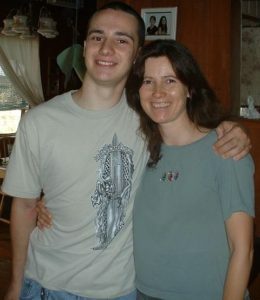 When Gabe was a young teen, one of his friend’s mom had foreseen that Gabe would lose an arm in the Army. I felt him with me that day that I was in the hospital, that he was an angel watching over my friend and protecting him from a worse outcome. The connection of the broken arm felt it meant something. I feel him when I spend time with his daughter. I see him in her. It’s funny, because the main way I see that is in her stubbornness. She wants things her way. She also thinks she’s really funny and likes to tease people. She probably got that sense of humor from him. I feel he’s close to her and watches out for her. I have often felt him when I’ve been at an annual Vision Quest ceremony I’ve helped out at. Our intercessor (or leader) asks for a ‘blooded warrior’ to hold the East Gate at the Sacred Fire. A ‘blooded warrior’ is someone who has taken a life in defense of his people. I feel Gabe there holding that gate. There are times he comes to me in my dreams and even in the dream I know he is dead and we are on borrowed time. I grab every moment I can have with him and cherish it. I always know it is fleeting and he is slipping away. That feeling has gradually faded more and more over the years. But I don’t want to let it go. I want people to know that I had a son and he was a good man and he was worth knowing and loving. This year I have started to write my story as a way of sharing and remembering and connecting again. I am finding that the feelings aren’t so far removed. I still love and miss him and in the writing I feel his connection strongly once again. Sometimes I’ll say I have two daughters and had a son, then tell them how he died. In more casual meetings I may not mention Gabe until the conversation gets deeper. I haven’t really been sure how to answer the question and for years I haven’t said much about Gabe because I didn’t know how to share it. I’m now learning it’s more important for me to be upfront about it and talk about him. I am realizing that the things left unsaid can carry a lot more weight than being open about it. But I also had to learn my own responses and find my strength to stand up to the people who try to tell me what I should think or feel. That has taken me time. The statistics don’t even call them people (men and women), they just say “our troupes.” I had to learn that “a troupe = one person.” We don’t see the faces. It is all so impersonal. I want people to remember that every life is a person. It is someone’s son or daughter. It is someone’s father or mother. This person had friends, sisters, brothers. They had a life. Yes, it is so easy for us to think of the number of soldiers dying in Iraq and Afghanistan as just numbers. The statistics don’t even call them people (men and women), they just say “our troupes.” I had to learn that “a troupe = one person.” We don’t see the faces. It is all so impersonal. I want people to remember that every life is a person. It is someone’s son or daughter. It is someone’s father or mother. This person had friends, sisters, brothers. They had a life. I don’t like the wars and I don’t support our reasons for being there. But the people are important. They gave their time, their freedom, their lives to a cause they thought would help us. Every time someone dies, for any reason, but especially in violence, war, acts of rage or any number of wild things that happen, I hope people will remember the person or persons behind it, the lives of people that were lost. I have started writing a story that is about my transformation, my healing and my grieving combined into sharing with others what Gabe’s life was about. Writing is the healing. I hope it will help raise this awareness. I hope it will touch the hearts of anyone out there who has lost a child. I hope it will help bring healing to soldiers who saw a comrade die in action. I hope it will bring us together. And even more, I hope it will awaken us to find better solutions to our conflicts, rather than fighting and war. I am writing my story as a transformational journey. I hope to find all the joy and purpose that Gabe would want for me. He was an inspiration to be all that I can be. Thank you for sharing, Ixchel. In these crazy times with the presidential election consuming so much of our collective thought, it is great to hear of your and Gabe’s experiences. It is an antidote to all the facades of an election season.